The lineup for Houston’s very own music festival, Free Press Summer Fest, was finally announced earlier yesterday morning. Some of the headliners include, Skrillex, Weezer (!!! 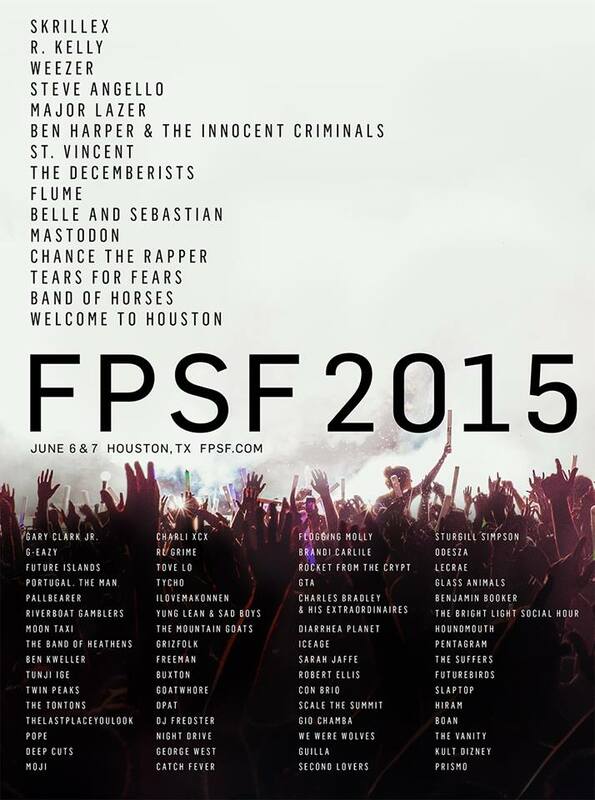 ), R. Kelly, St. Vincent, Tears for Fears, Welcome to Houston (including Bun B!) and possible Frontier Fiesta performer, Chance the Rapper. The festival will take place at Eleanor Tinsley Park on June 6 and 7! If you’ve never been to a music festival, this is a great starter! It’s not as big as ACL or Bonnaroo, but you’ll still get a really great music festival experience. You can get your tickets here! General admission is currently going for 158.50 (plus tax) so get them ASAP! If you want to have a really ballin’ experience, you can purchase the Silk Pajamas package, which includes two passes for stage side viewing, complimentary water and beer at a few stages, and exclusive merchandise, at a startling price of $999! Are you happy about the lineup? Who are you most excited to see? Leave a comment below!